I was blown away by the engagement ring that I was given by my fiance. He knew that I wanted something a little different with the colour/design of the ring and the ring was made spectacularly by Dan. for order to your specified finger size. We have made all manner of beautiful rings and pendants from our pink diamond rings to our Australian sapphire rings and pendants. Come and see us at out Sydney CDB showroom and I would be happy to talk you through some of my available work or make a custom piece just for you, you can even participate yourself if you would like to make the perfect ring for your partner we can make that too!! 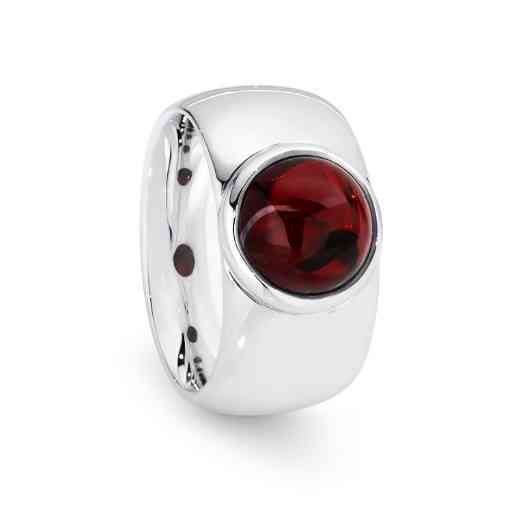 Materials: sterling silver and garnet wedding, engagement or just because you want to ring. Its bold style, and plain surface give way to the brightly reflective canvas that will have you admiring it all throughout the day. And every so often the sun will catch your subtly set dark centre cabochon garnet to release this radiant inner luminescence. Only you will see it, only you will know it, only you will love it. Open the magic of the rune to the Doctor Strange in your life. A beautifully designed two piece that seeks to explore the passive and aggressive sides of an independent individual. The lion represents a change and a strong drive to progress the self, and the maiden is in honor of the preservation of what is valuable and pristine in an individuals life. This piece really is designed for a stout hearted go getter, who faces the daily strength and struggle of self progression. 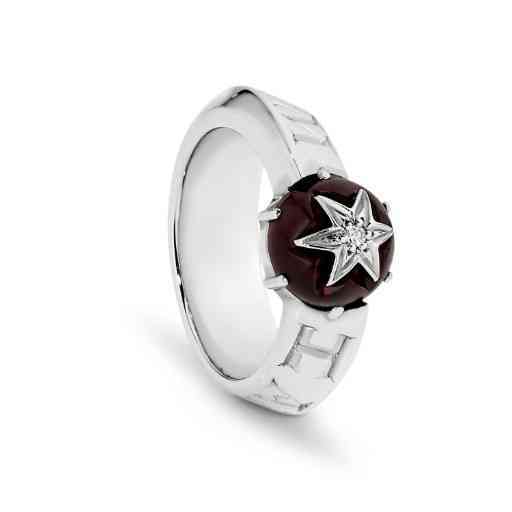 for those who has their own destiny in the palm of their hands, this ring is a reminder to keep striving. 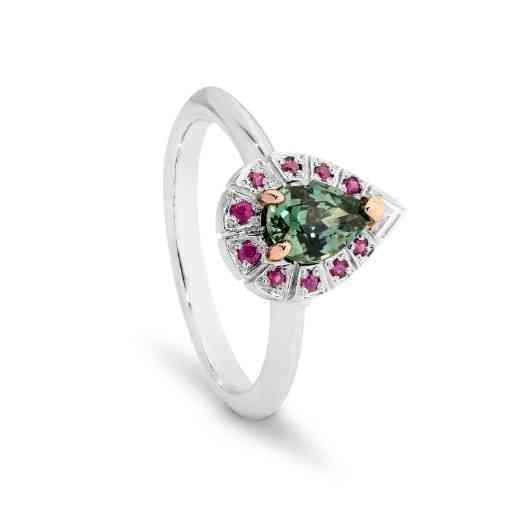 Materials: platinum and 18ct rose gold, ruby and teal Australian Sapphire. This is another Object maker original design either paired or individually worn, inspired by the subtle charismatic eminence of the Australian teal sapphire. We thought the only way to really show what that colour had to offer was to use an art deco inspired halo of ruby. the red and white give way to an overall poetic aesthetic resolve. its a feeling that can only be paralleled when the Sabina wedding ring completes the picture. what a beautiful set worn with Sabina #2! Sabina Wedding Ring. Materials: platinum and 18ct rose gold, Madagaskar pigeon blood ruby and teal Australian Sapphire. Ruby is quite possibly one of the most beautiful of all gemstones, and even when the are tine, they still give off an enigmatic warmth. This ring matches to the Sabina engagement ring as a wedding or eternity band. the vintage style of separating each stone gives the ruby their own little frame, like paintings on a gallery wall. 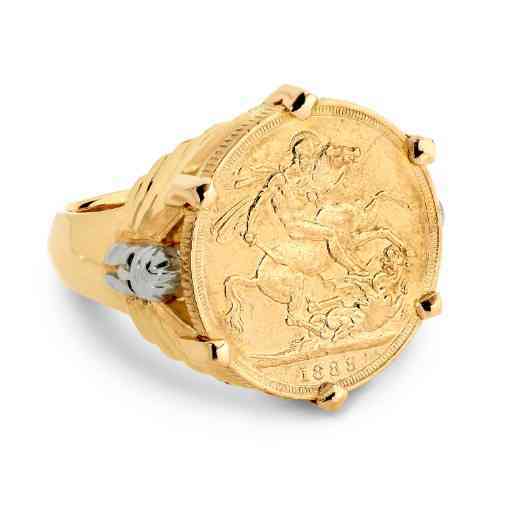 Materials: 18ct yellow gold, rose gold, platinum, an Australian sovereign ring from 100 years before your birth. This ring is extremely symbolic, it literally like a Victorian painting where every aspect tells part of the overall episode. let me break it down for you: its an Australian patriotic themed ring, the band is shaped as a sword to show we are of our word, and defend it with the sword. the platinum helm is that of service in justice, the wings of victory support the claws are that are the turrets of our castle, and the coin is of the sovereignty of our nation, and must be minted 100 years to the day before the wearers birth to symbolise heritage and unending dedication to the success and continuity of our freedom. 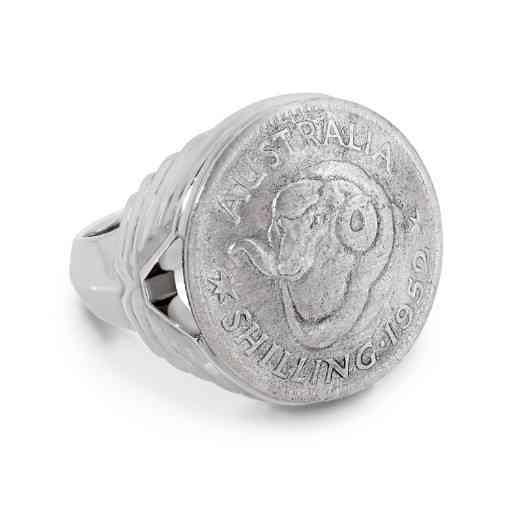 Materials: silver, This ring features a single Australian minted coin, that once knew the rounds of exchange in years gone by, but now remains a symbol of our sovereignty. The claws represent turrets of our national defense, and they hold our coin tight. The side wings are our freedom, our first world nation that is built on the shoulders of opportunity and ingenuity. The band is a sword, in respect of our word that we so freely speak. To be worn with national pride. Materials: 24ct gold. 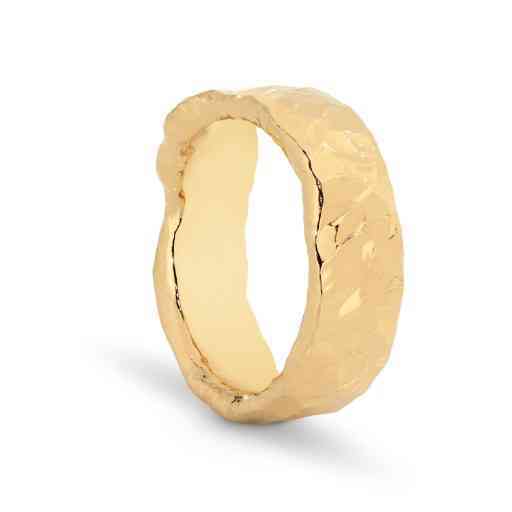 This ring is quite unique, its forged out of 24ct pure gold. It is very uncommon to use pure gold for jewellery in the West, due to the softness, but here it has been forged in such a way that it will be a bit harder wearing. You will still get a few dents here and there, but the design will go with it. if it look banged up when its new, then it’s always new right!? 24ct gold has a beautiful radiance to it that no other metal has, its got a good weight when you wear it, and a very high value. we cna make it in any weigh, but generally this ring come out at half to three quarters of an ounce. 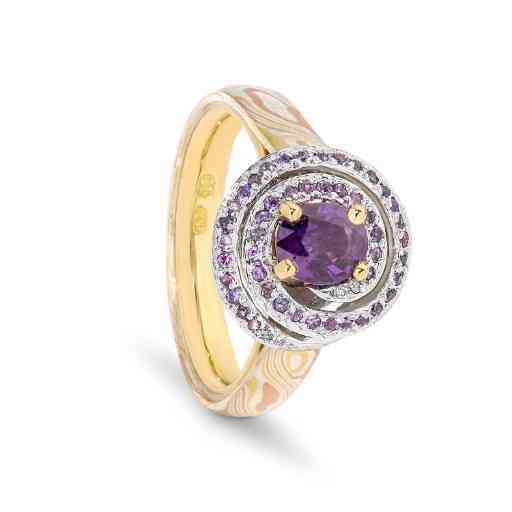 Materials: purple sapphire, diamond, 18ct white gold setting, 18ct yellow gold, 14ct rose gold, and silver mokume gane. This marvelous creation is so unique that it almost looks like a one of a kind work. 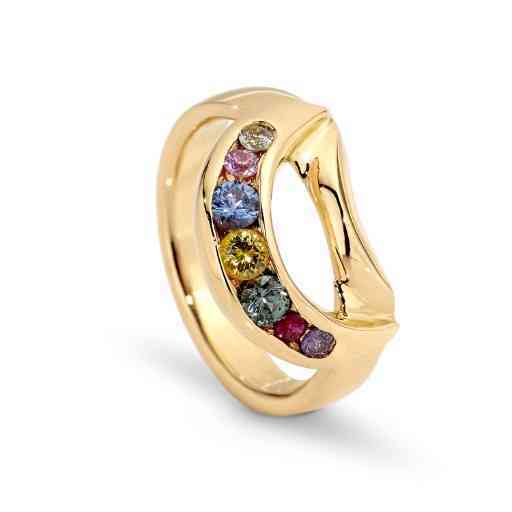 There is a spiral of precious stones twisting around a central oval shaped Gem, the underside mirrors the spiral. It has a band that sweeps up to the setting in an open style, and a clean gold inner ring sleeve to seal it off. 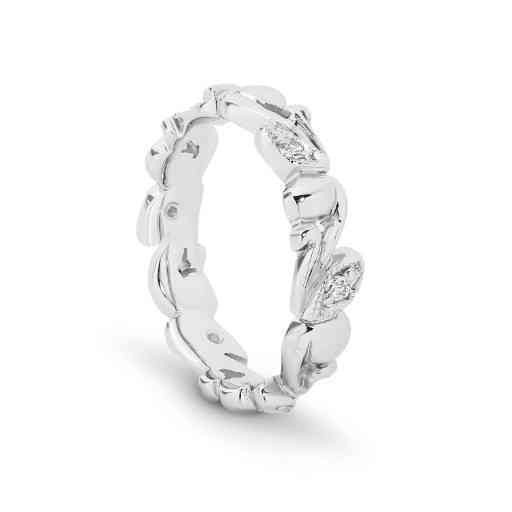 The rings band has a half round profile, and the inside is comfort curved for ease in wearing. Because of its diverse range of details, customers can customize colours extensively with one of our designers. This ring is also available in diamond. Have you ever looked at a ring, and just got totally transfixed? 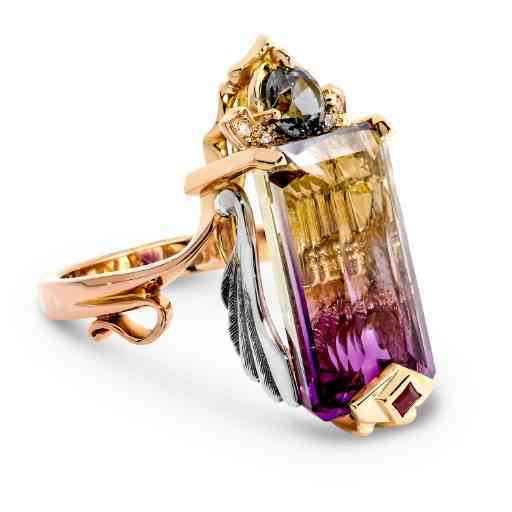 This ring is such a good example of a story that continually reveals itself. From the winged sides, to the multilayered gold carvings at the front, and of course the bright beautiful stones on display, you can find a loving essence that seems to emanate from within it. The artisan who created this did so with the absolute adoration of his craft, with care and skill, he brought us this ring, this artwork, and he called her Selina. 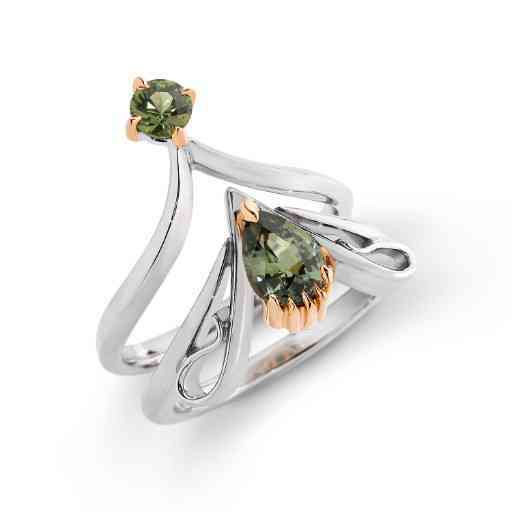 This ring is design adventure into the natural world, and exploration of the rocky outcrops and valleys. With its rough ore surface, and deep inner groove, it seeks to emulate a feeling as though it was found in the soil just as it is, without the help of human hands. 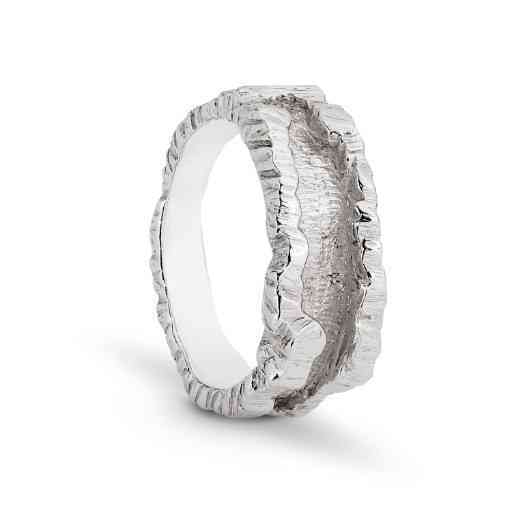 A beautiful, everyday ring suited for life’s rigorous wear and tear, surely to be enjoyed even as an heirloom. Sapphire is one of earths most beautiful gems, and here its displayed in a good variety of its colours. Believe it or not, but sapphire comes in just about every colour on the spectrum! Set in yellow or white gold, this smooth design offers a proud style with its crescent moon setting, and tapered sapphire. 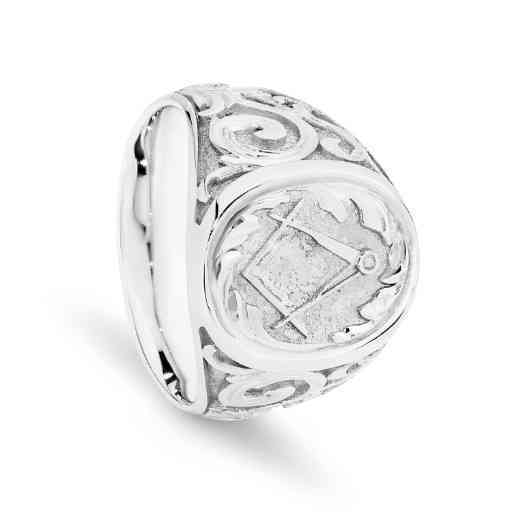 Prefect for a pinky ring, a wedding ring, or an everyday adornment. 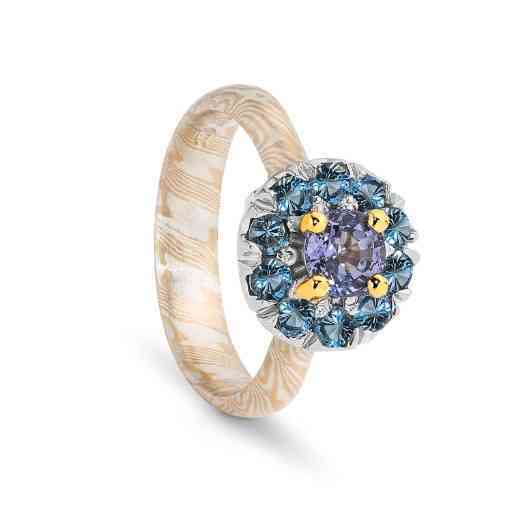 Materials: gold or platinum or mokume gane band, and diamond or sapphire stones arrayed like a beautiful flower blossom. Inspired by the magnificent Eastern lotus flower, this ring offers the wearer both delicate detail, and strong security for bigger stone options. ornate Mason. Materials: sterling silver. An old tradition is met with a vintage style of making. The subtle detailing of the square and compass is quickly absorbed into the surrounding scrollwork of a traditional engraving style. It’s a little play on visual poetry, hide the symbol of your secrets within the beauty of the past. Harmony ring set. 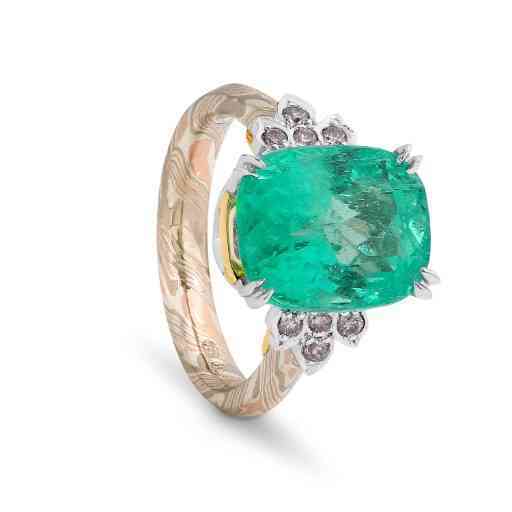 Materials: platinum with 18ct rose gold and Australian green sapphire. This stunning matching set is specifically designed off of the flowing symmetry of nature, with a hint of art nouveau in the mix. 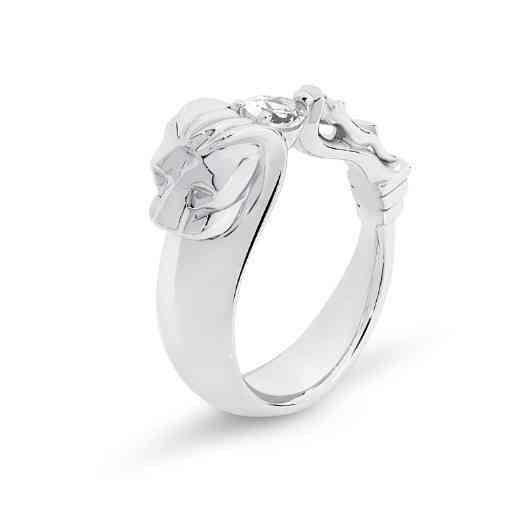 Its got a feature cenral 18ct rose gold claw setting, to hold a beautiful Australian teal sapphire. the matching fitted wedding band add so much to the design when they are brought together, almost as if the engagment wasnt complete without the wedding. its a stunning set, that can be furher enhanced by wearing the matching Harmony necklace. There are few times in life where one gets the opportunity to enjoy such an individual artwork as this. The stone itself, is a Columbian emerald of significant size. With its soft complexion, the memories around its body of a former owner, and subtle radiance, it will surly bring about a greater presence to the wearer. 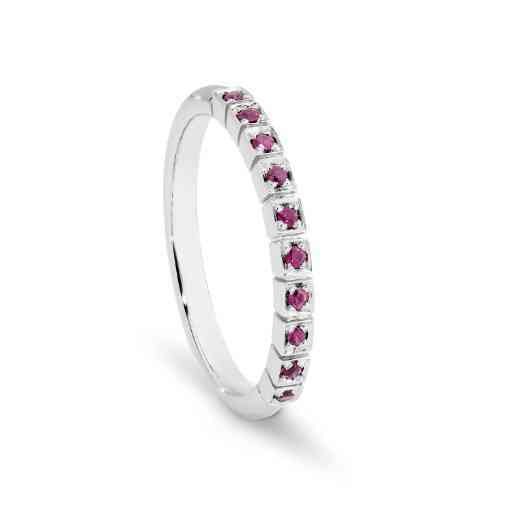 There is a small gift of pink diamonds either side, eight in total, subtle in colour also, perfect for the pastel vibe. The setting is made with an open style, simple and perfect, not too busy to detract from the stones, but enough detail to delight the viewer. The band has been flourished with a traditional Japanese technique of metal fabrication called ‘mokume gane’ just to add an extra hint of subtle detail. It’s a ring full of little secrets that only the owner would know and love, almost as though he had a cheeky and proud personality. 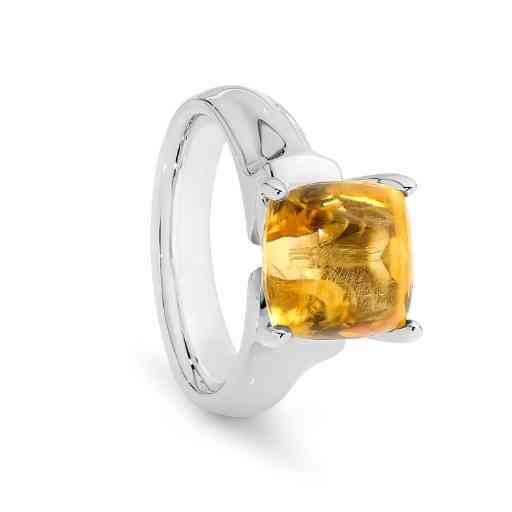 Materials: sterling silver and citrine. Materials: 14ct rose gold, with silver, mokume gane. 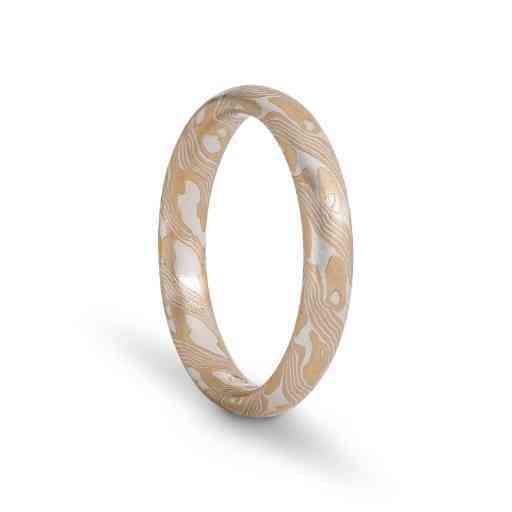 This finely detailed ring is a leading example of the versatility of mokume gane. The marble pattern exhibited here has been condensed with such precision to be sure that even a finer band like this can hold high detail. This ring has also had a gentle acid etch to bring up the pattern slightly. It’s got a rounded profile, with a deep comfort curve, and a rounded edge. Materials: platinum and sterling silver mokume gane. The loosely open pattern comes across as a billowing cloud running across the bright blue sky. What we found so remarkable about this pattern is that the combination of silver and platinum, tow white metals, that could contrast so well and we even went so far as to use a little acid etch to get the silver slightly lower, this was such a success because the pattern now totally pops out. for the lovers of white metal, this is a must and a one-off every single time. Materials: Beautiful 18ct yellow gold wedding band, inlaid with a cross pattern each centered with a Madagascar pidgin blood ruby. This contemporary take on a traditional classic is a timelessly elegant piece that will stand out from the crowd. Materials: Choose from diamond with gold or platinum. A delicately crafted ring, this beautiful design was inspired by the gothic stonework most commonly seen in the windows of heritage structures. You can see the points are evenly divided into four segments, and in between each is a little keystone that features a small diamond. What a marvelous tribute to the artistic elegance of bygone periods. It’s a perfect way to signify the timelessness of commitment, and love. 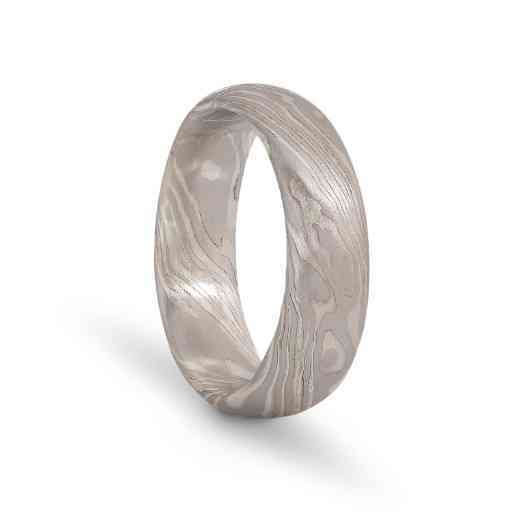 Materials: 14ct white gold, 9ct white gold, sterling silver mokume gane. 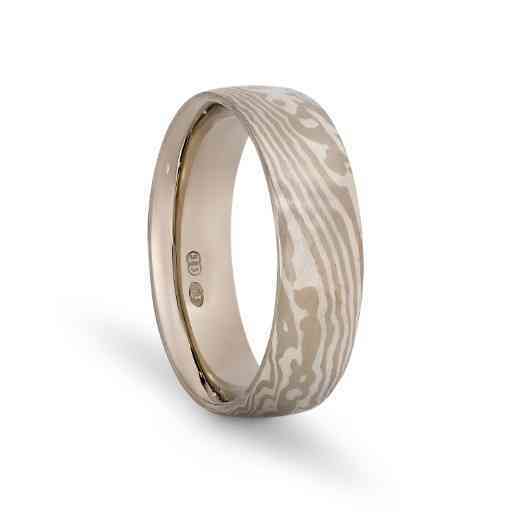 When you think of mokume gane, you don’t awlays think of scenery or landscapes. Most of the time it resembles a very slight essence of something flowing and transient. this design resembles a storm, termultuas as some points, and calm in others, but all the while having differeing shades of grey and white. with its low profile, shallow comfort, and overall thin thickness, it is designed to delight with a story, but also go nearly unnoticed for the wearer. 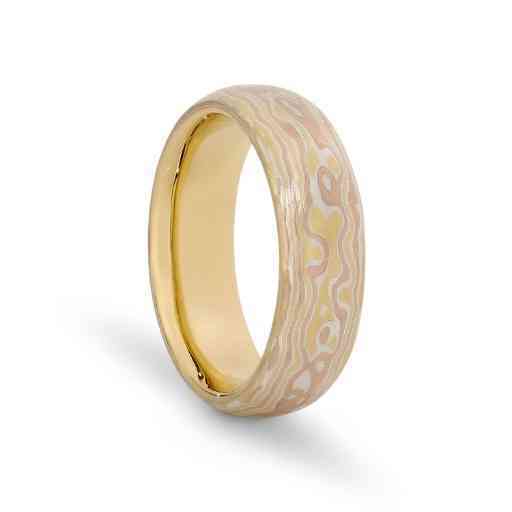 Materials: 18ct yellow gold, 14ct rose gold, and silver mokume gane. 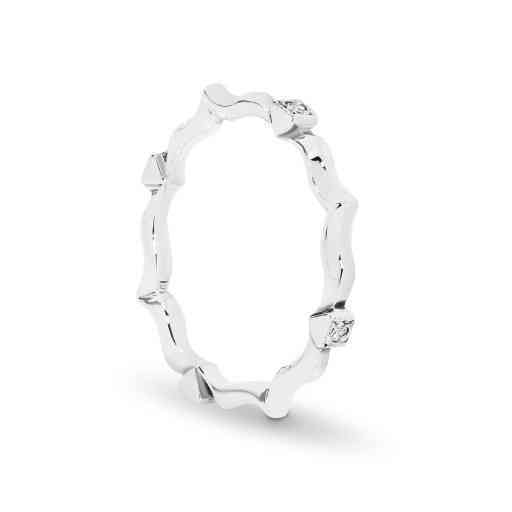 This majestic ring is quite simple in its execution, but so marvelously effective in its river like pattern. 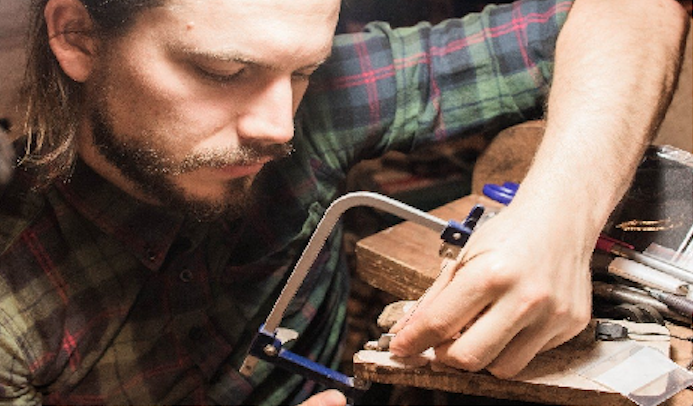 Manufacture involves removing metal and forging the mokume billet to bring about a sleek and linear design. The join is decorated with a single golden bar, and the inside is sleeved with gold to seal the designs simplicity. Materials: platinum or gold with diamonds. This beautifully designed vintage style ring is inspired by scroll design detailing in the art nouveau period. Forged form a block and hand carved out by chisel and saw, this timeless ring suits any occasion. It boasts 6 delicately set 1.5mm diamonds, and can be adapted in pattern layout to fit any finger size.